NextEnergy's new Tranquility R410A water-to-water (THW)™ series high temperature heat pump provides almost unlimited applications for hydronic heating systems due to the high temperature output (140°F), internal controls, and factory-installed options. 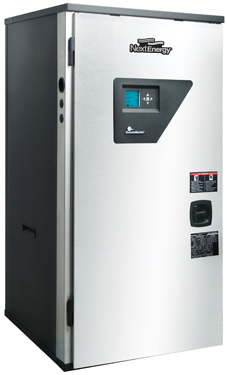 The THW series includes a special high temperature scroll compressor coupled with heat exchangers designed specifically for water heating, which results in unmatched efficiencies and performance. The new "Euro" look allows the THW™ heat pump to be cosmetically integrated with our full line of Tranquility heat pumps and storage tanks. Additionally, each unit is run-tested to ensure optimum performance. ClimateMaster’s Tranquility high temperature Water-to-Water series can be used for radiant floor heating, snow/ice melt, spa and pool water heating, domestic hot water, and many other options. The Tranquility Water-to-Water series offers high efficiency with advanced features, high temperatures, extremely quiet operation, and application flexibility at competitive prices. The series is available in a wide range of unit sizes for most any installation. ► With radiant heating, the room heats from the floor bottom up, warming feet and body first, and flooring radiates heat for a long period of time. ► Compressors are mounted on vibration isolation springs to a heavy gauge mounting plate, which is then isolated from the cabinet base with rubber grommets.